Evaluation license that was sent to you after you downloaded the product. In this case, after installation Veeam Backup & Replication will operate in the Community Edition mode. You can switch to the full version of the product if you install the license. For more information, see Community Edition and Full Version. If a valid license is already installed on the machine, the setup wizard will inform you about it. In this case, you can skip the Provide License step and move to the next step of the wizard. Next to the License file for Veeam Backup & Replication field, click Browse. 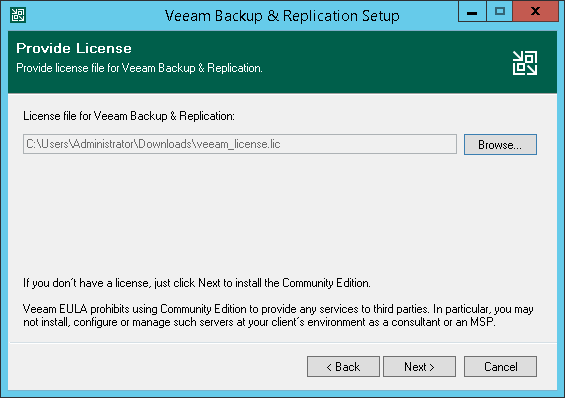 Select a valid license file for Veeam Backup & Replication.